Not to be confused with American engineering professor Sheri D. Sheppard. Sherri Evonne Shepherd (born April 22, 1967) is an American actress, comedian, author, and television personality. She has appeared in several TV shows in recurring roles, and starred as Ramona Platt on the ABC sitcom Less than Perfect from 2002 to 2006, for which she was well received and was nominated for the BET Award for Outstanding Supporting Actress in a Comedy Series in 2005. From 2007 to 2014, Shepherd was a co-host on The View, for which she received multiple Daytime Emmy Award nominations, winning one in 2009. In 2009, she starred in a sitcom of her own on Lifetime, Sherri, which was cancelled after one season, and also published the novel Permission Slips: Every Woman's Guide to Giving Herself a Break. In 2012, she appeared as a celebrity contestant on the fourteenth season of Dancing with the Stars. Shepherd was born in Chicago, Illinois, the daughter of LaVerne (d. 1991) and Lawrence A. Shepherd (born c. 1947), a church deacon. She is the eldest of three sisters. Shepherd first became recognized for recurring roles on the sitcoms Suddenly Susan, Everybody Loves Raymond and The Jamie Foxx Show in the late 1990s, before starring in the show Less Than Perfect in the lead role of Ramona Platt from 2002-2006. In 2009, she starred for one season in Lifetime Television's Sherri, a sitcom about Shepherd's life. She played Daphne in several episodes of How I Met Your Mother in 2013. As of 2017, Shepherd starred in NBC's mockmumentary legal comedy series Trial & Error in the lead role of Anne Flatch. The show is currently being shopped around to networks for a third season. In addition to her film and television work, Shepherd appeared on Broadway in Rodgers and Hammerstein's musical production of Cinderella in 2013. She co-hosted the 35th Daytime Emmy Awards on June 20, 2008. The View's panel (left–right Whoopi Goldberg, Barbara Walters, Joy Behar, Shepherd, and Elisabeth Hasselbeck) interview United States President Barack Obama on July 29, 2010. In 2006, Shepherd was a frequent guest co-host on ABC's The View. She became a permanent co-host from 2007 to 2014. She received several awards for her work on the show. Since leaving The View in 2014, Shepherd has continued to make several appearances on the show as a guest host and "lead contributor" throughout 2015 and 2016. Shepherd was criticized after one 2007 broadcast of The View. The show was often filmed "live", with little or no editing. She stated that she didn't "believe in evolution. Period." Co-host Whoopi Goldberg asked her, "Is the world flat?" She first responded, "I don't know," and expanded that she "never thought about it". Shepherd continued that it was more important to her that she thought about how she was "going to feed [her] child". Barbara Walters replied by pointing out, "You can do both." However, Shepherd then went on to quote Scripture. Shepherd later referred to her statement as a "brain fart" brought on by nerves. Barbara Walters and Shepherd talked after that episode: Walters said, "Dear, the Earth is round", and Shepherd responded with: "Barbara, I know that!" Shepherd (center) on The View with Joy Behar and Elisabeth Hasselbeck. Similar criticism erupted after the December 4, 2007, broadcast of The View when, during a discussion initiated by Joy Behar about Epicurus, Shepherd attempted to assert that Christians existed in classical Greece, and that the Greeks threw them to the lions. When confronted on this point, she further claimed that "Jesus came first" (before Greeks and Romans) and stated, "I don't think anything predated Christians", to which Joy Behar responded: "The Jews." Shepherd garnered criticism after admitting to never voting partly due to her upbringing as a strict Jehovah's Witness. She was quoted as saying that she just "never knew the dates or anything"; she stated, "I've never voted for anything in my life." In January 2008, Sherri referred to Gospel singer Shirley Caesar as "the black Patti LaBelle." LaBelle, like Caesar, is black. In March 2012, Shepherd participated as a celebrity contestant on the fourteenth season of ABC's Dancing with the Stars. Her dance partner was Val Chmerkovskiy. The team lasted several weeks. As of 2015, a project includes a line of wigs and hair add-ins. Shepherd wrote the book Permission Slips: Every Woman's Guide to Giving Herself a Break, published in October 2009. Shepherd also has a co-author credit on Plan D: How to Lose Weight and Beat Diabetes, published in 2013. Sherri raises funds for the YAI Sherri Shepherd "Believe in Abilities" Fund. YAI  organization encourages autistic and developmentally challenged children to participate in life. In 2011, Shepherd offered to pay six months' rent and utilities of homeless former American Gladiators star Debbie Clark (Storm). Shepherd was previously married to Jeff Tarpley from 2001 to 2010. TV writer Lamar Sally proposed to Shepherd on December 26, 2010. They married in August 2011 at the Fairmont Hotel in Chicago, and in September 2012, Shepherd said the couple was searching for a surrogate in order to have a child. Sally filed for separation on May 2, 2014, and Shepherd filed for divorce days later. In July 2014, Sally petitioned a Los Angeles court for full legal and physical custody of the child expected via surrogacy, who was born in August 2014. On April 21, 2015, a Pennsylvania court ruled Shepherd is the legal parent of a child born from a surrogate mother. Shepherd has type 2 diabetes after having had pre-diabetes for years. Shepherd is a devout Christian. ^ "Sherri". mylifetime. Archived from the original on 28 November 2009. Retrieved 14 May 2014. ^ "Sherri Shepherd". YouTube. Retrieved 14 May 2014. ^ "NickMom Night Out". web. Archived from the original on February 16, 2015. Retrieved February 15, 2015. ^ Andreeva, Nellie. "Sherri Shepherd To Return To 'The View'". deadline.com. Penske Business Media. Retrieved 16 March 2016. ^ Gilchrist, Tracy E. (2007-09-19). "Media Blender". GayWired.com. Archived from the original on 2007-10-28. ^ "New "View" Co-Host Sherri Shepherd Doesn't Know If World Is Flat". Huffington Post. 2007-09-18. Retrieved 2007-09-20. ^ "Sherri Shepherd: Trading pain for the laughs". San Jose Mercury News. 2009-10-11. Archived from the original on 2013-04-05. Retrieved 2009-10-11. ^ Danny Shea (2007-12-04). "Sherri Shepherd Doesn't Get That Whole BC Thing, Insists "Jesus Came First"". Huffington Post. Retrieved 2007-12-05. ^ Michael Starr (2007-12-05). "'View' History Lesson: Sherri Shepherd Says Jesus Came Way First". New York Post. Retrieved 2007-12-06. ^ Jefferson, Cord (January 29, 2008). "Sherri Shepherd Admits to Never Voting". Mollygood. Archived from the original on 2008-02-01. ^ Kerr, Luke (January 16, 2008). "Sherri Shepherd Forgets Patti LaBelle is Black". Daytime Confidential. Archived from the original on July 18, 2011. ^ "Sherri Shepherd Admits to a Problem with Rudely Interrupting People". web. November 3, 2014. ^ "QVC Online Catalog". QVC. Retrieved March 23, 2015. ^ Permission Slips: Every Woman's Guide to Giving Herself a Break. Grand Central Publishing. October 5, 2009. ISBN 978-0-446-54742-0. ^ Shepherd, Sherri; Fitzpatrick, Billie (April 30, 2013). Plan D: How to Lose Weight and Beat Diabetes (Even If You Don’t Have It) (1st ed.). It Books. p. 320 pages. ISBN 978-0062226242. ^ "Believe in Abilities". Archived from the original on November 3, 2014. Retrieved November 25, 2014. ^ "YAI". Retrieved November 24, 2014. ^ "'View' Host Offers Help To Homeless Ex-'American Gladiator'". San Diego, California: KGTV. January 29, 2011. Archived from the original on May 4, 2017. Retrieved May 4, 2017. ^ Howell, Samantha (April 1, 2018). "Former 'The View'Co-Host Caught Up in Ongoing Legal Drama, Report Claims". Entertainment Daily. ^ Hammel, Sara (January 4, 2011). "Sherri Shepherd Engaged". People. ^ Webber, Stephanie (May 9, 2014). "Sherri Shepherd's Husband Lamar Sally Files For Divorce After Nearly Three Years of Marriage". Us Weekly. Retrieved April 23, 2015. ^ "Sherri Shepherd files for divorce". UPI. May 12, 2014. Archived from the original on May 13, 2014. Retrieved 2014-05-14. Her filing comes after Sally filed for legal separation May 2. ^ Olya, Gabrielle (July 30, 2014). 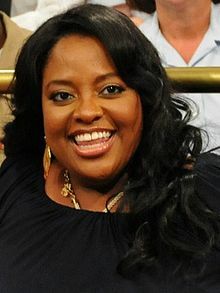 "Custody of Sherri Shepherd's Surrogate Child Remains 'Unclear' as Due Date Nears". People. Retrieved April 23, 2015. ^ Wozinsky, Jessica (August 6, 2014). "Sherri Shepherd's Surrogate Gives Birth to Baby Boy Amidst Custody Battle". Parade. Archived from the original on April 23, 2015. Retrieved April 23, 2015. ^ Plan D: How to Lose Weight and Beat Diabetes (Even If You Don't Have It) Archived March 5, 2016, at the Wayback Machine. sherrishepherd.com. 2013. Retrieved 2013-04-05. ^ Siegler, Bonnie (April 12, 2012). "Balanced Living – Sherri Shepherd". Viva Magazine Online. Archived from the original on June 30, 2013. Retrieved 2013-04-05. ^ Allen, Marshall (June 2006). "From Crass Comedy to Christ Talk". Beliefnet. Archived from the original on July 2, 2015. Retrieved 2011-10-07. ^ "Reviews - Transformers: The IMAX Experience". FilmJerk.com. 2007-09-21. Archived from the original on 2014-05-14. Retrieved 2014-05-14. ^ ""The Locket"- How I Met Your Mother- Mondays 8/7c". Retrieved 22 August 2017. Wikimedia Commons has media related to Sherri Shepherd.